CELINE Boogie Bag - one of its finest collection. Monogram canvas with leather trimming. 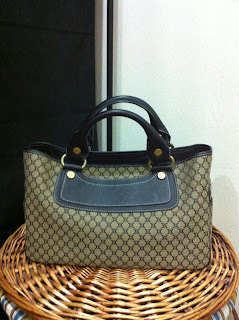 Very nice bag indeed but unfortunately, it has been so lonely in the closet. It is as simple as the name says - items on sale are pre-loved or otherwise stated. Oh yes.... all my stuff, be it used or new are authentic items. I don't support FAKES at all !!!! Prices shown inclusive of postage which will ONLY be done on Wednesday via Registered Pos or Pos Laju with additional RM7.00. I can consider COD or pick up but at my convenience ONLY. If u are interested in any of the items listed, kindly email me at gimme2ndchance@gmail.com - discounts applicable for multiple purchases ONLY. All SALES are FINAL and AS IS - No return and No exchange. Payment accepted thru Maybank ONLY - account no shall be provided once transaction is confirmed. Mommy of one at an older age and very vulnerable when it comes to buying !!! Usually end up with unused stuff and now is worst cos I have my lil son to shop for.... Poor husband !! !